Carter Sloan is a trained assassin—the best there is, pulled out of cryogenic sleep whenever an assignment demands his skills. So when he’s kept in the deep freeze for 258 years, he’s seriously pissed off. Yet his government needs him, to hunt down the enemy known as the Daughter of the Brass Dragon. 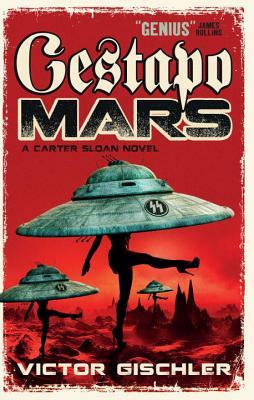 The future of the galaxy-spanning Reich depends on it, so Sloan is off—screwing, swearing, and shooting his way across interstellar space. lt’s action, adventure, and disgusting gelatinous aliens as only Victor Gischler can create them. VICTOR GISCHLER is the master of the outrageous action-packed novel. Previous works include his violent, witty, sleazy debut "Gun Monkeys" (Edgar Award First Novel finalist), the over-the-top hitman novel "Shotgun Opera "(Anthony Award nominee), the post-apocalyptic "Go-Go Girls of the Apocalypse," the action-packed gothic romp "Vampire a Go-Go," and the darkly humorous noir novel "The Deputy." For comics Gischler created the maniac Deadpool Corps for Marvel Comics (featuring the character slated for a major motion picture), spent two years writing X-Men, and is writing season ten of Angel & Faith in Joss Whedon's Buffy the Vampire Slayer universe, as well as the Titan Comics Grindhouse-style series Sally of the Wasteland. Victor Gischler was born in Sanford, Florida. He is a world traveler and earned his Ph.D. in English from the University of Southern Mississippi. He received The Black Corsair Award for adventure literature and was nominated for both an Anthony Award and an Edgar Award for his mystery writing. A stay-at-home writer and father, he currently lives in Baton Rouge, Louisiana with his college professor wife and their son, and would grill every meal if his wife would let him.